Sorry, folks. I have not got back into doing my “week in suppers” feature. With soccer almost every night, we’re eating early, and that means a rushed and thrown-together meal. Quick sides, lately, include asparagus oven-roasted with salt and olive oil, and spinach salads with homemade dressings. Seasonal happiness. But nothing very special. However, Kevin and I had an at-home date on Saturday. He sourced the ingredients, and I was the chef. And it was really good. Seared tuna steaks served atop smashed, roasted potatoes, topped with a reduced red wine sauce with capers and scallions. 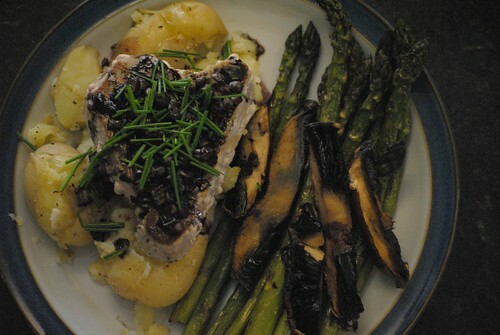 Plus the stand-by of the asparagus mentioned above, also roasted with portobello mushrooms. Seriously yummy. Kevin made us a couple of martinis. And we watched a funny/sweet movie, completely chosen at random, called Adventureland. I’d recommend it. Yesterday I ate a banana for supper. Not recommended. I played a soccer game from 4-5:30, then raced home to shower and wash the blood off my knee (seriously; I was playing against a rough defender), and pretty myself up in order to bike to another reading. The banana was all I had time for until arriving home, nearly 10pm, when I devoured Saturday night’s leftovers. I love leftovers. I also managed to bake four loaves of bread yesterday, and make and freeze six meal’s worth of turkey stock. Productive! Which is good because Saturday was most unproductive. I felt myself melting into a anxious stasis. General exhaustion. On Friday afternoon, racing to squeeze in one last errand, I found myself fantasizing about just stopping. Standing still, refusing to go on with the tasks before me. Of course, that wasn’t an option. Instead, I kept up the momentum, and biked off to pick up the kids from school for swim lessons. It was so hot! Everyone was so grumpy! The complaining! The epic whining! And to top it off, we had one kid bleeding from a pedal injury before we’d even reached our destination. And I hadn’t brought bandages. Let’s just sum up this adventure by stating for the record: Everyone survived! Parenthood is not the most romantic occupation. If anyone’s trying to tell you otherwise. :: I’m in Burlington tomorrow morning at Books & Brunch. Readings start at 9:30am. :: Wednesday evening, I’m looking forward to hearing my former boss, Noah Richler, talk about his new book What We Talk About When We Talk About War. Here’s the invite on Facebook. Join me? Starts at 7pm, at the Laurier Centre for Military and Strategic Disarmament Studies (now that’s a mouthful). One last thing to note. Another lovely blog review of The Juliet Stories, this time from a fellow red-headed mama. Read on.